Year-round sunshine, pristine beaches and sophisticated Arabian charm all await you in this stylish city. Your dream Abu Dhabi holiday can be an affordable reality, with these luxurious 4* hotels. Experience the dazzling wonders of Abu Dhabi’s lavish designer lifestyle at a sensational 5-star resort. Select from this list of our favourites, and get ready for a luxury holiday of a lifetime. Abu Dhabi is without a doubt one of the world’s most luxurious and wealthy cities. 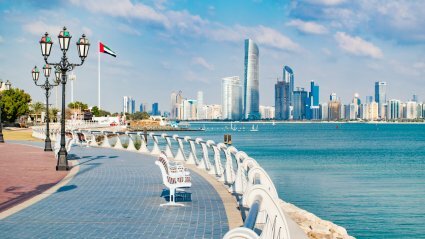 Much like Dubai, Abu Dhabi is a sprawling Middle Eastern metropolis, where you’ll find five-star resorts, immaculate beaches, designer boutiques and futuristic skyscrapers. The city’s beautiful mosques and ancient fortresses give holidaymakers a real insight into the Middle East’s rich Arabian heritage. The UAE’s dazzling capital may be a millionaire’s playground, but you don’t have to be a millionaire to holiday here. In fact, Abu Dhabi holidays are great value for money. Flights: You can fly to Abu Dhabi International Airport direct from Manchester Airport and from most London Airports. Other airports in the UK may include a stop off on the way. Passport/visa requirements: Your Passport must be valid for a minimum period of 6 months from the date you enter the United Arab Emirates. You will be granted a visa free of charge for a single visit of 30 days upon arrival in Abu Dhabi. Packing essentials:Abu Dhabi enjoys fantastic weather all year round, so you should make sure you pack light clothing, sunglasses, a sun hat and sun cream. Away from the beach and resort women should ensure that shoulders and knees are covered at all times. The hardest part about planning a holiday to Abu Dhabi is fitting everything into one trip. The city is awash with iconic tourist sites, theme parks, world- class restaurants and fabulous nightspots. Those travelling with young children or family will want to make time for Abu Dhabi’s Yas Waterworld. The water park has no less than 43 different slides and attractions, with rides catered to visitors of all ages. Following in a similar vein is Ferrari World – the world’s largest indoor theme park and the car giant’s first attraction of its kind. The park is located in the city’s Yas Marina Circuit, where the annual Abu Dhabi Grand Prix is held, and boasts a whole host of simulators, children’s rides and superb rollercoasters, including Formula Rossa, the fastest roller coaster in the world. Abu Dhabi is also home to another one of the world’s biggest indoor theme parks; Warner Bros World. The ultimate fun-filled family destination, adults as well as children will love exploring the lands of some of their favourite cartoon characters such as Scooby Doo, Bugs Bunny and Batman. Another fantastic family-friendly attraction is the Emirates Park Zoo. Here you can get up close to a whole host of animals, including giraffes, monkeys and camels. One thing all Abu Dhabi holidaymakers are urged to do before leaving is pay a visit to the Observation Deck at 300, which provides visitors with stunning views of the city. The deck can be found in Tower 2 of the Eithad Towers, on the 74th floor. The towers are just one of Abu Dhabi’s spectacular landmarks. The huge Marina Eye is another option for sightseers. Located along the Corniche Breakwater, the spectacular Ferris wheel features 42 viewing capsules and allows visitors the chance to enjoy sensational panoramic view of Abu Dhabi. Other interesting buildings include The Landmark, the Presidential Palace and the extraordinary Sheikh Zayed Mosque, which is one of the largest of its kind in the world and is open to visitors all week long, apart from Friday mornings. With a capacity for an incredible 40,000 people, tourists will be astounded by the sight of one of the world’s largest chandeliers in the main prayer hall and the mosque’s 82 perfectly shaped domes. If you are planning to visit the mosque, remember to respect local customs by covering up. Elsewhere, a trip to the Qasr al Hosn fort is recommended. Entry to one of the city’s oldest structure is free and well worth a visit for those wanting to delve into Abu Dhabi’s colourful history. On top of historic monuments and full-throttle parks, Abu Dhabi is also home to some of the region’s best beaches, for those looking to just kick back and relax. A raft of souvenir spots for tourists can also be found in this spectacular city. Indulge yourself in a choice of traditional markets, souks and shopping outlets, including Marina Mall, Dalma Mall and the brilliant Abu Dhabi Mall, which provides holidaymakers with the ultimate shopping experience. With so much on offer, you may want to ask yourself, is a week here really long enough? You’re seeking the perfect combination of beach and city. You crave sophisticated relaxation in 5-star surroundings. You’re looking to share action-packed days of family fun at some truly amazing theme parks. You hope to discover a destination with a rich heritage and sensational sights, both old and new. Holidaymakers can expect Abu Dhabi’s weather to be fine and sunny, all year round. 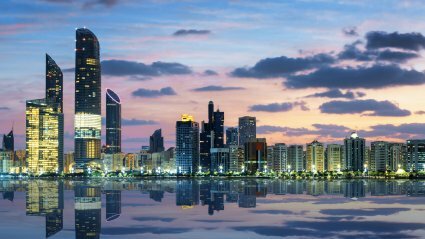 Abu Dhabi’s peak season usually runs between October and March, as this is when the temperature is more manageable, ranging from the mid to high twenties. Summer is less popular, with temperatures hitting the high thirties to early forties on hot days. Whilst this may seem like the weather sun worshippers crave, hot and humid conditions can sometimes make for an uncomfortable stay. As well as being one of the world’s most luxurious cities, Abu Dhabi is also blessed with immaculate beaches and shimmering blue seas. Arguably the most popular stretch of sand in Abu Dhabi is Corniche Beach. Offering an abundance of water sports, trendy beach clubs and the chance to stroll or even rollerblade along the boardwalk, there are plenty of activities for those looking for more than simply to relax in the sun. Another stunning stretch of shoreline is the Al Bateen Beach. This family-friendly beach offers clear, calm waters for swimming, snorkelling and fishing. Al Bateen Beach also boasts children’s playgrounds and is a superb spot for beach volleyball and a host of water sports. An ideal setting for a blissful day of relaxation or fun is Saadiyat Public Beach, on Saadiyat Island. This magnificent stretch of white sand attracts sunseekers with comfy loungers, tempting waters, and weekly yoga classes. Saadiyat Island is also a nesting site for Hawksbill Turtles. To protect these critically endangered creatures, elevated boardwalks have been created to stop people disturbing the nests in the sand dunes. During nesting season, night lighting close to the beach is also reduced so as not to distract the baby turtles and stop them from heading in the wrong direction away from the sea. Nests are monitored and avoided by beach maintenance crews and all beach furniture is moved off the beach at night. For those seeking to escape the crowds, there’s no better place than the white sands of Mirfa Beach. An ideal place to sit back and let the world go by, Mirfa Beach is also home to the Al Gharbia Water Sports Festival, featuring events such as kiteboarding, wake boarding and surf-ski kayaking. The event also features live evening entertainment, children’s play areas and a Sunset Souk. Camping facilities are also provided. As well as Abu Dhabi’s public beaches, a number of resorts and hotels also offer the use of their private beaches to non-guests for a small fee. These beaches often include added luxuries, including sumptuous loungers, bars and restaurants. Reflecting the UAE’s trading heritage, Emirarti cuisine features ingredients from across Asia and the Middle East and is infused with spices to create flavours not to be missed during your holiday in Abu Dhabi. One dish popular with locals is Al Madrooba, a delicious combination of salted fish, spices and a thick sauce. It is often sprinkled with saffron, nuts and spices and served with rice. Another delicious dish, that is a must-have at weddings and after fasting during Ramadan, is Al Harees. Made with meat, wheat and salt, it is slow-cooked in a clay pot and served with ghee. Al Majboos is another Emirati favourite, which is usually made with chicken or lamb boiled with a blend of spices and layered with rice. One Arabic dessert that stands out among the crowd is Luqaimat. Similar to doughnuts, this sweet treat takes the shape of delicate little fried balls of dough, drizzled beautifully with date syrup and sprinkled with sesame seeds. The ideal finish to your scrumptious Abu Dhabi meal. Abu Dhabi has become quite the hub for top class sport in recent years, with a host of major sporting events being hosted in this sensational destination. Since 2009, Abu Dhabi’s Yas Marina Circuit has played host to Formula One motor racing. Located on the spectacular Yas Island, the circuit enjoys a scenic waterfront setting that rivals similar races at Monaco and Singapore. It is also now the traditional final race of the season, ensuring excitement and all-out action. With five grandstands specifically designed to protect spectators from the desert sun, Abu Dhabi is one city that’s certainly in the fast lane. Although not always held here, Abu Dhabi has proved a popular location for the Club World Cup in recent years. It pits together the six champions of their respective continental tournaments plus the host nation’s national league champions. With the UEFA Champions League winners taking part each year, it ensures some of the world’s best footballers are in participation. A popular part of the Abu Dhabi sporting calendar since 2009 has been the World Tennis Championship. Big crowds flock to the International Tennis Complex to try and catch a glimpse of the sport’s stars in action as they compete to be crowned champion. Past winners of the men’s singles include Andy Murray, Rafa Nadal and Novak Djokovic. It is usually held in January or December. Part of the competitive European Tour, greats of modern golf compete in four days of thrilling action, in the hunt to claim the coveted falcon trophy. Since its inauguration in 2006 the contest has been lauded by players past and present. For those wanting to watch this championship in all its glory, you’ll certainly be treated to a raft of unforgettable golfing memories. The Arabian Gulf’s most impressive course plays host, but will you be there to witness a new champion in the making? Due to security reasons in Pakistan, since 2010 the country has played most of their ‘home’ matches in Abu Dhabi or Dubai. In Abu Dhabi, the 20,000 capacity Sheikh Zayed Cricket Stadium has played host to some memorable matches in Test, ODI and T20. It also regularly hosts pre-season training camps and domestic T20/T10 tournaments. Ramadan is the holy month in which Muslims fast between dawn and dusk to commemorate the revelation of the Quran (Islam’s holy book). Shops and restaurants change their working hours, often opening in the evening; a time when people eat at home alongside friends and family or visit festive tents and enjoy traditional Arabic mezze and sweets. Ramadan ends with a three-day celebration called Eid-Al-Fitr, where families and friends exchange gifts. Abu Dhabi also hosts a dazzling firework displays to mark the occasion. Eid Al Adha is the ‘Festival of Sacrifice’, celebrating the end of the Hajj, the annual pilgrimage to Mecca and commemorating the sacrifice of the prophet Abraham. Families mark Eid Al Adha by dressing in their best clothes and attending their local Mosque. People also give donations of money and food to charity. Since 2009, Abu Dhabi’s Yas Marina Circuit has played host to Formula One motor racing. Located on the spectacular Yas Island, the circuit enjoys a scenic waterfront setting that rivals similar races at Monaco and Singapore. With five grandstands specifically designed to protect spectators from the desert sun, Abu Dhabi is one city that’s certainly in the fast lane. One of the most popular events on the sporting calendar in Abu Dhabi is the Abu Dhabi Golf Championship. Since its inauguration in 2006 the contest has been lauded by players past and present. For those wanting to watch this championship in all its glory, you’ll certainly be treated to a raft of unforgettable golfing memories. The United Arab Emirates National Day falls on December 2, marking the day the seven emirates banded together to form the UAE in 1971. Spectacular firework displays are organised around the city, as are national heritage programmes, such as music concerts, art festivals and theatrical shows; all of which commemorate this special event. Why book a holiday to Abu Dhabi with Destination2? Here at Destination2 you can choose from a wide variety of lavish Abu Dhabi hotels and resorts. We work hard to bring you the very best prices and ensure you get value for money when booking your holiday to Abu Dhabi. Our dedicated Middle East specialists are on hand to assist with any queries and ensure the booking process goes as smoothly as possible. With a wealth of knowledge regarding travel to Abu Dhabi, they will strive to unearth superb deals and help you jet off on the trip of a lifetime to this dazzling destination.